I’m alone today at Ragdale, or so I thought. This morning was a rush with everyone leaving. But I’d signed up for a workshop here tomorrow, so it made more sense for me to spend the night. I’m in the living room in the Barn, the building where my room is, and where I’d hoped to capture the last sunset. But it’s clouding over, so I doubt my phone camera can catch it. I’ve sat in this spot on the couch nearly every day of the last 18, and only today saw that I’ve been watched all along. 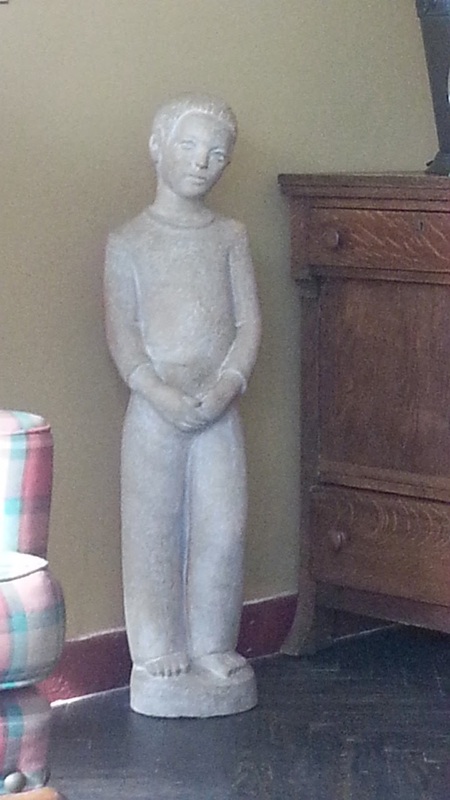 I’m not sure if this is a statue created by one of Howard Von Doren Shaw’s family or if it was commissioned or created by an artist-in-residence. Anything is possible here. Shaw, an architect from the Arts and Crafts movement, built Ragdale in 1897 for his parents and his own young family. Many of them were creative. 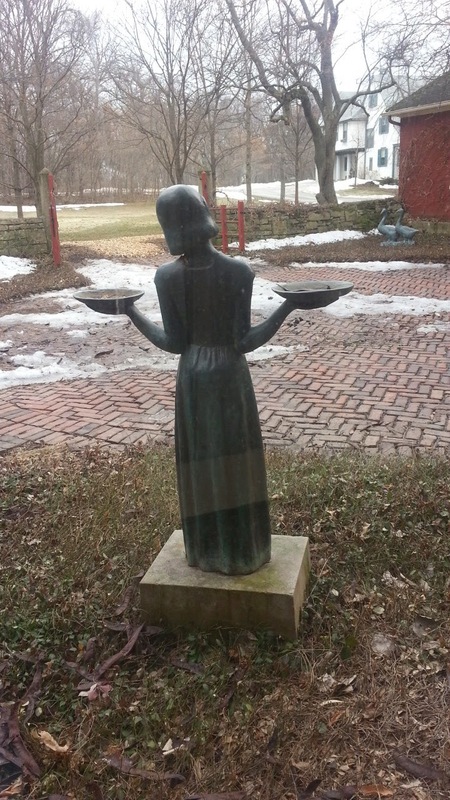 Bird Girl is a sculpture made in 1936 by Sylvia Shaw Judson that was featured on the cover of the 1994 novel, Midnight in the Garden of Good and Evil. Either side are bird feeders, and it won’t be long before they will be doing their job, as they have for nearly 80 years. 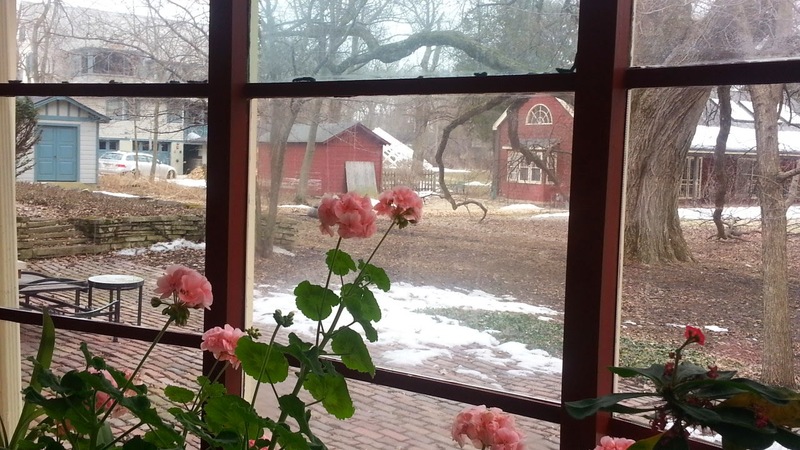 As I suspect, the clouds hid the sunset but they can’t hide how pretty it is as the geraniums and I peek out at all that the grounds reveal without the blanket of snow covering them. I’m going to miss this little peace of heaven that is Ragdale, all of the great artists I met and a staff and cook who couldn’t be kinder or more respectful of the creative process. And I’m even going to miss that quiet little plaster boy in the corner who’d been watching along with me all this time. But I miss my family and all the raucous joy and love they fill up my heart with all the rest of the year. I am one lucky person. And, to think, gratitude is only one thing I’ve learned here. If that were the only lesson anyone ever learned, how wonderful this world would be. Yes, indeed, I am one lucky person.